A 2Draw Christmas present for da momma..
yay! that's really cute... hehe... i think i need to make me a xmas icon now... lol!! This is very nice. ^^ I love the detail of everything. Also, I had a question.. are you and momma married..? It's perfect! Thank you. :) (((kiss poppasweetie))) WE are the Lags, inatryrb. There's a cardinal where I work that has been banging into the window all day long for months. The Lag Family website is http://www.angelfire.com/in4/lagfamily/index.html .. hope that's the right link. Great pic!!!!! I like the color choices!!!!! THIS IS WONDERFUL WORK! 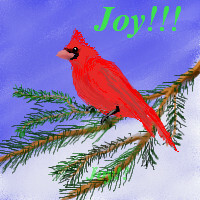 LOVE CARDINALS! Just because somebody says something nice about your'e work it doesn't mean you have to say something nice about there equally crappy work in return.